Being cool isn't about having the fastest car or the quickest quips; it's all frame of mind. Whenever you need an attitude adjustment, you need KEEN Utility Men's 1006977 Black Atlanta Cool Steel Toe Work Shoes. Cool is feeling good, being confident and sometimes, ... (see full details) (see specifications) #KEN1006977. Being cool isn't about having the fastest car or the quickest quips; it's all frame of mind. Whenever you need an attitude adjustment, you need KEEN Utility Men's 1006977 Black Atlanta Cool Steel Toe Work Shoes. Cool is feeling good, being confident and sometimes, playing it safe. What's cooler than having comfortable feet? These athletic shoes are designed all in black, with dual pull tabs on either side of the mouths of the KEEN Utility shoes. The tabs assist you in stepping into the comfort you'll find inside. The lace capture system is designed to create a snug, secure fit around your feet. Reflective webbing adds visibility to the slip-resistant shoes. Mesh lining surrounds feet in airy, ventilating fabric that allows heat to escape so your skin stays cooler. This works to keep your feet cooler in warmer weather. The comfortable footbeds are made in a dual-density design to give you two layers of softness. These are also removable. The EVA foam footbeds are made in a supportive, contouring Metatomical design to cushion every line of your feet. The compression-molded midsoles of the black shoes are likewise made in a dual-density design to further soften your steps. Soft EVA foam absorbs impact, placing a lightweight cushion between you and the ground. The shanks are made for torsion stability to keep your steps steady. It's all attached to non-marking rubber soles that absorb painful impact. The slip-resistant tread on the men's shoes gives you grip on wet, icy, and slick floors. Oil-resistance protects the rubber from corrosive chemical agents. The steel toes are designed in a left and right asymmetrical design that's made to match the shape of your feet. Protective steel guards tender toes against impact and compression. KEEN Utility Men's 1006977 Black Atlanta Cool Steel Toe EH Shoes give your feet ASTM F2412-11 and F2413-11 I/75 C/75 EH protection. They'll absorb dangerous electrical shock so you won't. If that's not cool, what is? This was previously listed as style U100 22. Great shoe, Comfortable. they do fit to normal shoe size. I've had them for 8 months now and and on my feet for 12 hrs+ 4-5 days a week. They are starting to break down on the inside and my feet are hurting. This is pretty normal for my type of work. They are heavier than a normal non-steel toe, however they dont feel heavy while wearing them. I love being able to slip them on and off with out tying. they are not hot either. looking to purchase my next pair, i dont see anything else that i would like to wear. The only thing is that you can't wear no-show socks, the collar will rub your ankles, but low socks work just fine. I bought these shoes for work. I have purchased Keen sandals and shoes in the past. They are a great work shoe. They are nice and light. I wish they would tie is the only thing. My foot is long and narrower. Men would be fine with the width. I wear them after work also. Most comfortable work shoe I have owned. Will be buying another pair when mine wear out, whenever that is . They are very sturdy. Good for industrial work place. Your toe doesn't rub on the steel. They are shaped for right and left foot. Great shoe. Have gotten a lot of comments also. I hope you don't sell out in my size. These shoes are the most comfortable low cut steel toe shoe I have ever had. I have worn them almost every day for a year now and they show minimal wear. They fit true to size and if anything a little bit narrow compared to a non-steeled toe version. I love the quick lace system and will soon be ordering my second pair. I use these as my everyday work shoe. I am an aircraft mechanic, and am usually on my feet all day or sometimes under the aircraft...I have no aches or pains in my feet after 8 hrs since wearing these shoes. I'm going on 2 yrs,on the same pair and they are still in great shape...there are a few worn spots on the bottom of the tread, but nothing out of the ordinary. I have recommended these shoes to other coworkers, and will most likely buy another pair when and if these wear out. My husband and I only wear Keens. We both have to wear steel toe shoes for work and need them to be long lasting, comfortable, and lightweight as we walk a lot. Excellent arch support and breathable shoes, these Keens really meet our needs during hot Oklahoma summers! The toe box is incredibly roomy, with the unique design that Keen uses. 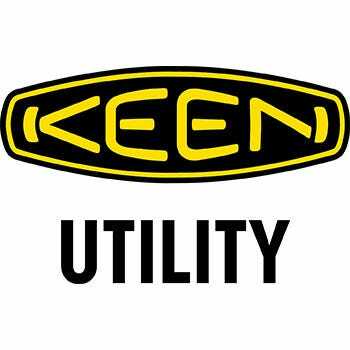 KEEN Utility 1006977 Men's Atlanta Cool Steel Toe Shoes is being added to your cart.